Aesthetics Datasets - Ritendra Datta, Ph.D.
Below are made available a set of datasets that can potentially be used for aesthetics inference experiments. Please refer to the following paper for more details about these datasets. Also, if you happen to use any of these datasets in your research articles, we request that you cite this paper in the article. The images themselves are not included in the datasets due to copyright issues, but methods for constructing the URLs of the images are described. It should be straightforward to obtain the images by crawling them. Please adhere to any copyright restrictions that apply. If you have questions, clarifications, or errata, please do not hesitate to contact me. This dataset contains 20,278 images with properties similar to the one described in the above paper. The only differences are that it is a larger dataset, and that only those photos were included in the dataset which have received at least 10 ratings. This ensures greater stability in the average aesthetics scores. Please download the dataset and its description file by clicking on the links below and saving the files. This dataset contains 16,509 images as described in the paper above. Please download the dataset and its description file by clicking on the links below and saving the files. If you be still interested in a direct comparison of your results with those in our ECCV paper, read on. I will still continue to insist that the bigger, more stable dataset above is the way to go. (a) all_features.dat.gz - Plain text file containing 3581 rows, one per Photo.net image. (b) description.txt - File describing what each column means. Please refer to the ECCV paper to get more technical descriptions of these features. 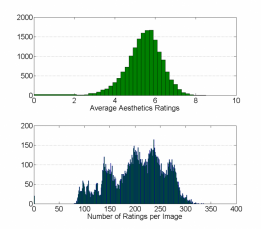 Note that some of the original aesthetics/originality scores may have changed since we collected the data, since the Photo.net community continues to rate these pictures.